The Salad is the main dish!If you have read any of the books regarding plant based food plans such as Eat To Live, Eat For Health, Unprocessed, Forks Over Knives or Engine 2 My Beef With Meat – just to mention a few. One of the take-a-ways from all of them is to make nutritious foods, especially green vegetables the basis of your daily food plan. Dr Fuhrman says to remember “Salad is the main dish.” Even if you don’t change anything else in your food plan just adding one large salad a day could make big improvements in your overall nutrition. It will also leave you feeling full and satisfied for hours. This illustration is from Eat For Health and it clearly demonstrates how much more volume you get by spending your calories on foods like spinach, eggplant, fruit and beans. You see your stomach has these stretch receptors that signal satiety after detecting the volume of food eaten. 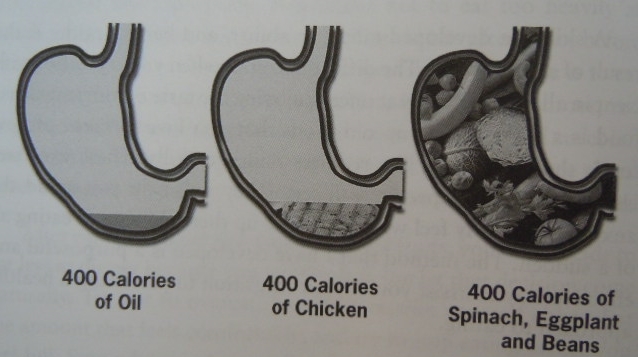 Also the nerve linings of the digestive tract monitor the calories and nutrient density of the foods we eat. When we eat foods filled with nutrients and fibrous bulk we not only feel full but our body is satisfied because we have given it the nutrients it needs. When we eat food that don’t have nutrients and fiber our brain keeps giving us the signal to eat! Try filling up on nutrient dense food that has the least amount of calories like green vegetables, fresh fruits and beans. Calorie for calorie the most nutrient dense foods are plants! The combinations of greens and other veggies to fill your salad bowl is nearly endless. I have a salad like this for lunch almost every day. If I don’t get it for lunch then I try to have it for dinner. Note that this isn’t a wimpy little salad dish – no it’s a huge dinner plate piled high. The salad with 1/2 cup of beans weighs about 12 -16 ounces. Twelve – sixteen ounces of greens, veggies, beans and a nut based salad dressing is a ton of food for around 400 – 450 calories. There is no shortage of protein either – it usually adds up to around 20 grams of protein. Did you know that greens are packed with protein? Romaine lettuce has 1 g of protein in just 6 leaves. Spinach has about 1g protein per 1 cup for only about 10 calories per cup! Greens will fill you up not out! When you add a 1/2 cup serving of beans to your salad you boost the protein and fiber even more. Plant foods are nutrient dense, loaded with vitamins, minerals and phytonutrients. Yesterday afternoon I received a text message from my son asking if I wanted to go on a hike with him. I didn’t have to think twice – Yes! I quickly got ready, packing snacks and bottled water. 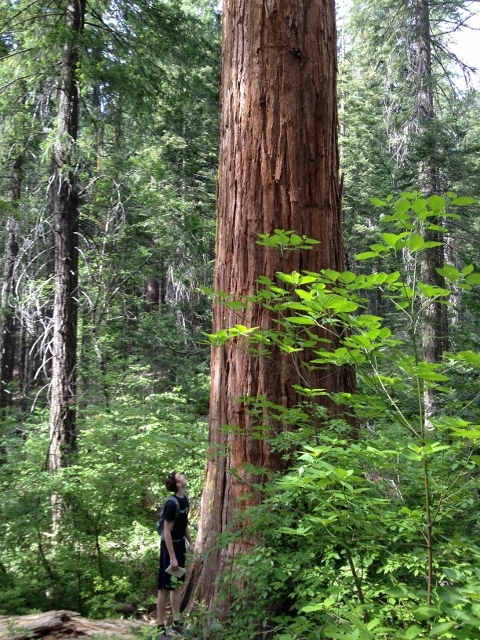 As soon as David arrived we loaded up and took off for an almost two hour drive to The Placer Big Trees Grove. Part of the adventure is the drive on a winding, twisting road with views that make you go oooh, aaah! Once there calmness takes over as you enter the thick canopy of an old growth forest. 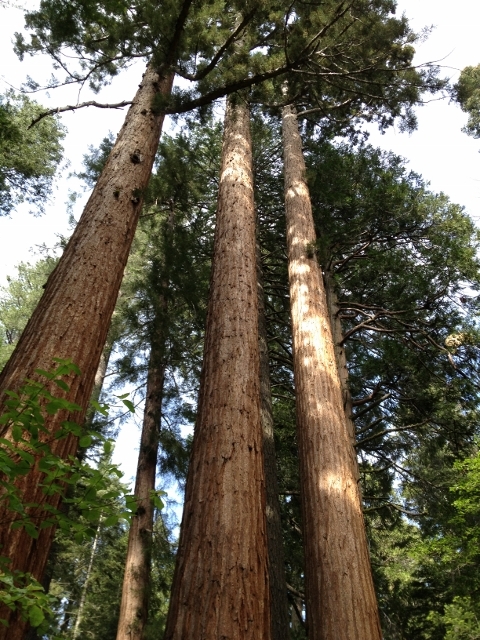 It’s a small but impressive grove of Giant Sequoia trees. I had been there years ago but had forgotten how beautiful it was. The trail is full of beautiful scenery at every turn. Thank goodness I had one of my huge salads for lunch before we set out on our hike. I forgot my camera so all of these shots were taken with my iPhone. These big trees make you feel small. Even David at 6’4″ looks short next to these giants! This tree is 225 feet tall and 12 feet in diameter. The blackened fire scar is called a catface. Cones, needles and other flammable material built up at the base of the tree. 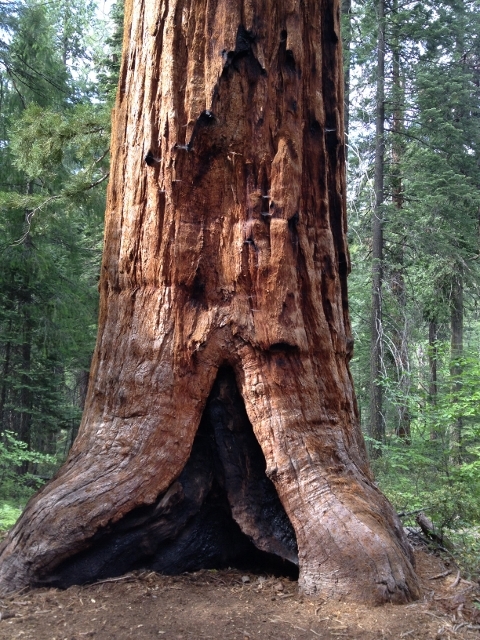 When a forest fire burned through the grove, these materials burned concentrating heat and flames against this portion of the trunk and burning a hole in the base of the tree. The tree is slowly healing itself by laying down a new layer of wood each year. Over time the scar will completely disappear. There is a free map guide at the trail head that gives you detailed information about what you see on the hike. Details like, no other tree has the reddish bark and deep green foliage like the Giant Sequuoia. This little group of trees is estimated to be about 500-700 years old. 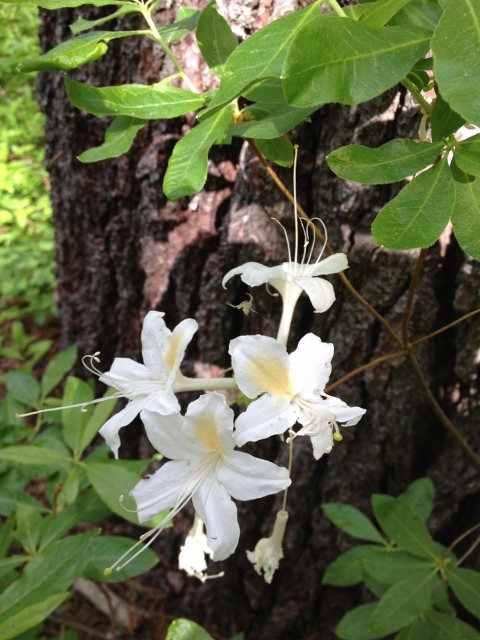 Western Azaleas are in bloom in the forest between May and July. 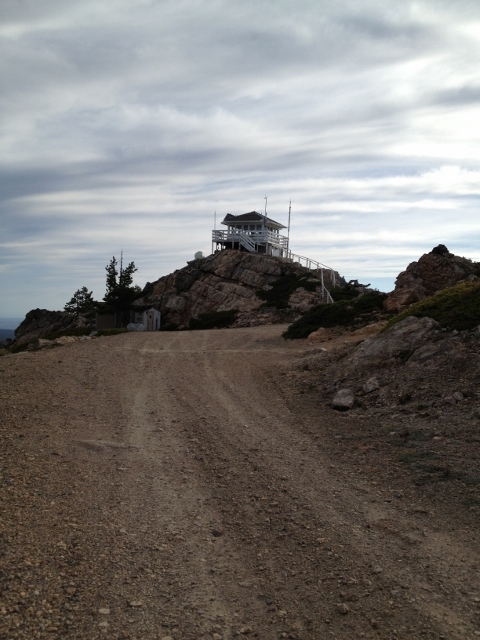 David had read about the Duncan Peak Fire Outlook Tower that was located just a few miles up the road from the Big Trees Grove in the Tahoe National Forest. 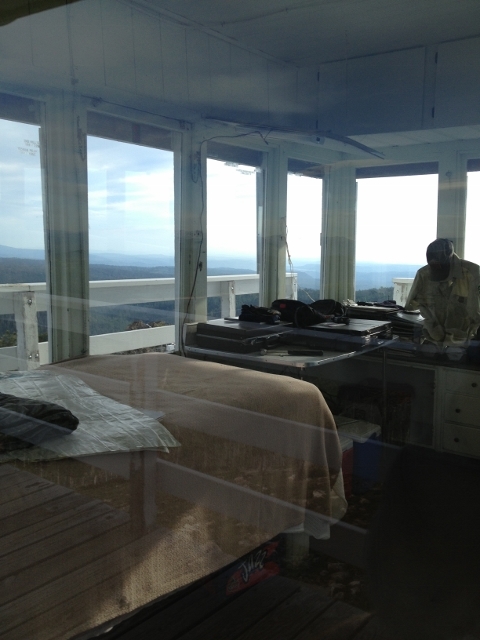 Since it was still daylight when we finished our hike we decided to check out the view from the fire tower. Well, we drove as far as we felt it was safe as the road got bad in a hurry. Not to be daunted by a bad road David suggested we park the car and hike the rest of the way. He was sure it was only about 1/4 mile. He is a chip off the ole block as his dad would have done the same thing! It was more like 2 miles of hill climbing with switch backs but he kept saying I think we are almost there! Just as we approached the gate about 1/4 mile from the tower we encountered the guy manning the tower leaving in his truck. Thankfully he stopped and gave us the okay to proceed and take a look from the tower. 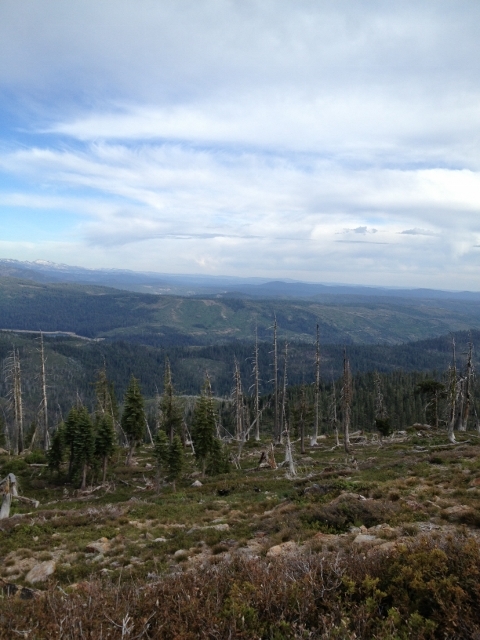 The views from the fire lookout tower were nothing short of amazing. So worth the extra hike to get up there. 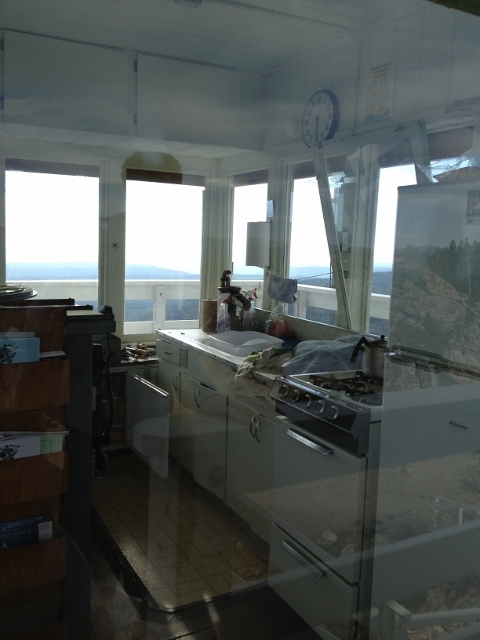 Here is a little peak inside the fire outlook tower. All the comforts of home. The top of each window was labeled with information about the view from that window to make it easy to pass on information about the location of fires. It was really interesting. What a shame the guy working the tower didn’t come back before we had to leave. It would have been interesting to talk with him. Well maybe next time. Oh and there will be a next time. When I told hubby Tom about our adventures he said “I want to go, you have to take me to see it”. Okay I know this post is long but I just have to share this photo of cows in the forest. We had seen these signs all day showing cattle crossing and we thought it strange. I mean, really who thinks of cows being in a forest? We wouldn’t have believed it had we not seen this with our own eyes. 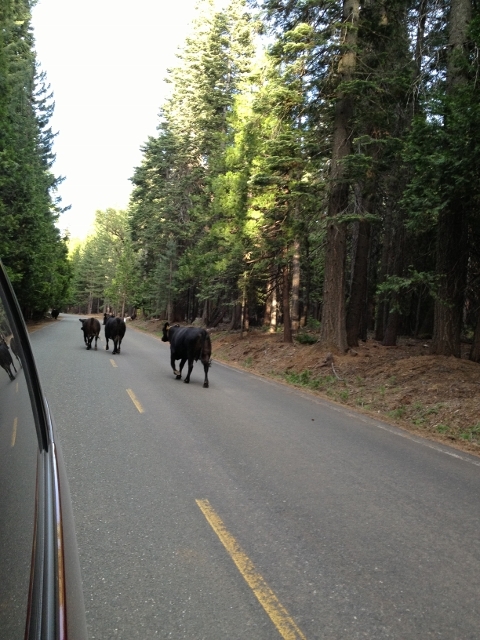 As we were leaving the road from the tower we encountered a herd of cattle in the road. They all had really loud bells around their necks and they approached the car as if to great us. I passed David my iPhone to take a picture and as soon as he held up the phone they all scattered! I’m still wondering what cattle find to eat in the forest. It was a fun, spontaneous, adventure filled day with my son David. I hope we can do this again soon. Thanks for taking the time to read this post. I’m glad you are here. Feel free to leave a comment or ask a question. What was the last spontaneous thing you did? I am trying to get myself to invest the little extra time it takes to prepare salads more often. 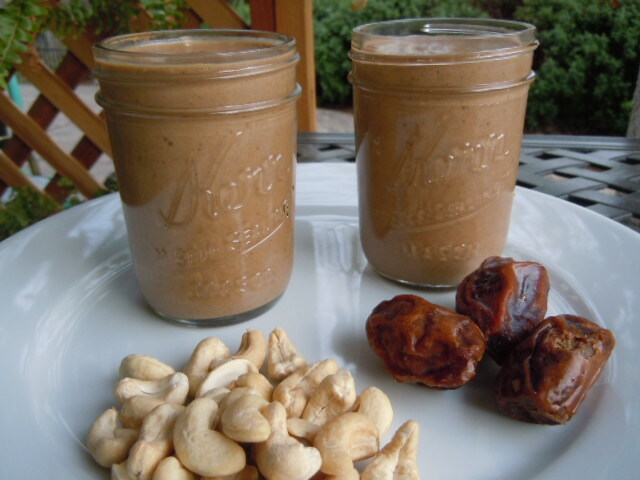 They are such a great way to fill up on healthy food. Love the info you shared on that. ANd I can’t wait to try your dressing recipe!!! 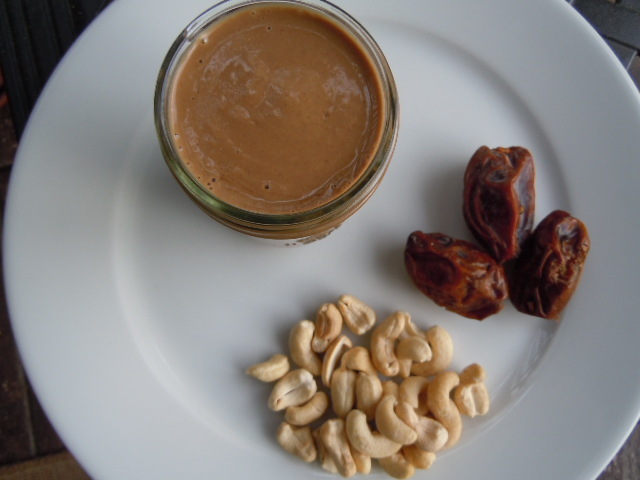 I love nut butters too! PS ~ Your hike looks amazing…. what a gorgeous area!!! Be sure to come back and let me know how you like the salad dressing Kim. 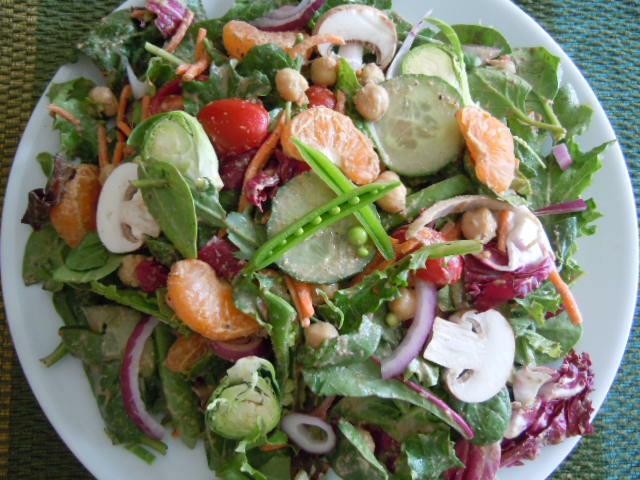 I am so hooked on these big salads and now with the summer veggies it’s even better. I’ve started making nut-based salad dressings. In fact, I made a very similar dressing today, but it had lemon juice instead of balsamic vinegar. I’ll have to try it with balsamic vinegar! What a gorgeous hike! Even better that it was not planned. Your dressing sounds good too Andrea. It really helps to make the salad filling. 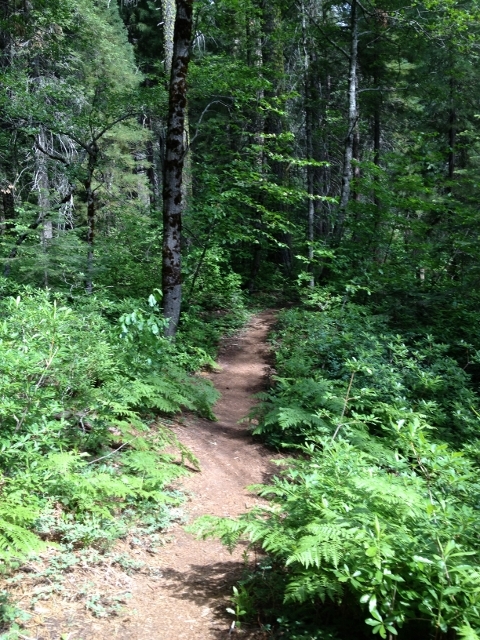 How nice to live withing a couple hours of trails like this! Around here there isn’t hiking, just walking-lol. Nothing wrong with walking Veronica! We are so lucky to live where we do as we have access to the foothills, mountains and the ocean with just a short drive. It’s great that you figured out what you needed in your diet to keep feeling full Cammy. Since my body is it’s own little cholesterol producing machine I can’t have meat anymore. I also love lentil tacos – they are so filling and tasty too. Your hike looks amazing! What a great way for you and David to spend some time together!! I am so thrilled you have found a food plan that you are loving!!! I bet the dates add a nice sweetness to that dressing. 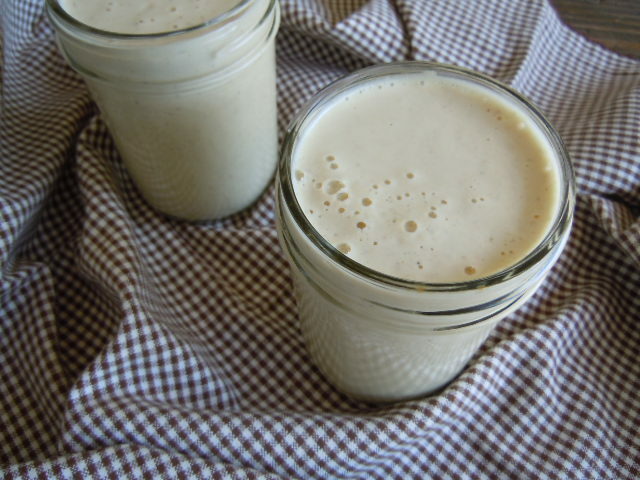 I love making my own dressings instead of using the store bought ones. What a great time you spent with your son! As always, jealous of your gorgeous surroundings. Wow, those trees are amazing – it makes your son look tiny!! Cannot wait to try out that dressing – the stats aren’t that bad either! Hope you have a great weekend Tami! What a nice looking hike! And the cows are a nice surprise. I spent the weekend in Seattle with a girlfriend and we did all sorts of spontaneous crazy things!! It was a nice change from the norm. Glorious scenery, and beautiful food. What could be more perfect? I MUST try your salad dressing. When I was at Costco yesterday, I noticed they have those Ball smoothie jar/glasses with straws in a 3 pack. Thought of you as soon as I saw them! Too funny about the Ball jar/mugs! I hope you enjoy the salad dressing as much as we do Janine. 🙂 So good to see your comment. I hope things are going well for you and your family. Two of the basic categories of balsamic vinegars are dark barrel-aged balsamic vinegars and whitebalsamic vinegars. The white varieties are not considered true balsamics, but were created as an alternative to the dark varieties which could discolor certain foods. They are refreshingly sweet and tart in comparison to the more complex darker varieties which can be thick and rich in flavor. Some of these white balsamic vinegars are even being used to flavor shaved ice gourmet snow cones recently.